It’s a weekday and you are absolutely knackered but want something tasty to eat? This cous cous is packed with vegetables, flavour and can go with a whole variety of things including halloumi to make a tasty meat-free dish or be loaded with even more vegetables, whilst taking the halloumi away, to make a super tasty vegan meal; it is great to bulk up to produce leftovers too! Put the recommended amount of cous cous into the glass bowl. I do this by eye from the packet but the packet will give you weight recommendations or lines on the side to indicate one portion. Mix in the salt, pepper and any herbs you want to include for seasoning. Pour in the boiling stock just so it covers the top of the cous cous. Place the lid or cling film tightly onto the bowl as this will help the cous cous to soak up all the liquid and go soft. Fry the onion in a pan, oil is optional, until they go soft and start to brown before adding the sliced mushrooms. Once the mushrooms are nicely browning as well add in the pepper and any other vegetables you want to add in. If you have vegetables that struggle to cook in liquid then make sure you cook those with the onions and mushrooms before adding anything wetter such as carrot. Mix in the half tin of chopped tomatoes and put it on a low simmer. I opt for half a tin for two portions because when you go to mix this with the cous cous any more can make it a bit of a liquidy mess. Whilst the mixture is simmering away put a pan of oil on a high heat until it is fully heated up OR put the grill on a high heat with some foil underneath to catch anything falling. Once it has reached that point add in the halloumi pieces and step back! Wait for one side to go a light golden brown and flip it over until the other side is a similar colour; if you let it go more golden it can start to get a bit squeaky on the teeth. As the halloumi is nearing a finishing point make sure that the cous cous has absorbed all the stock and is soft to eat. Once that is confirmed add the tomato and vegetable mixture into it ensuring that it is well blended together. Serve the cous cous and put the halloumi on the side. This would also work well with a side salad in the summer. Cous cous is not something that I have ever attempted to reheat and is something that I probably would not recommend. It should be perfectly tasty and not have any texture issues after being covered and popped into the fridge. This is one of the few leftovers that can pretty much be served and eaten straight from the fridge within minutes (a lot of things normally need to get used to room temperature or be reheated first). 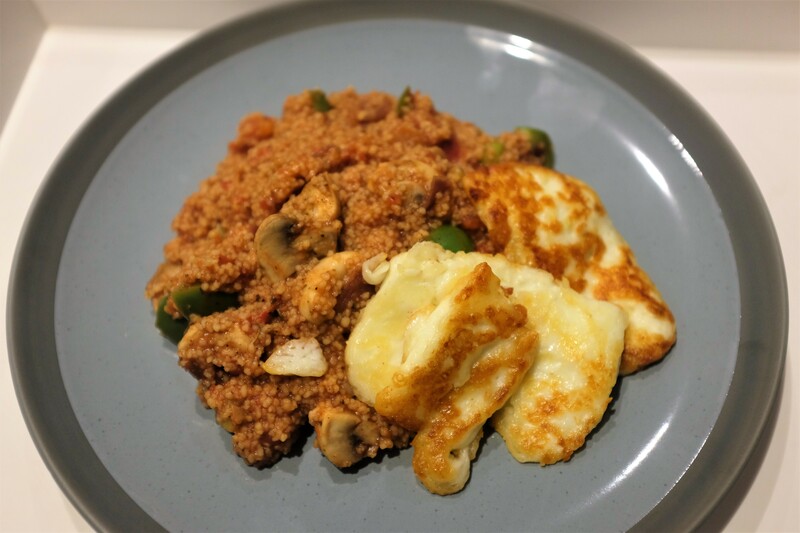 With the halloumi I would recommend just cooking what you want on the night and then doing the rest fresh either the following day or with the next meal that suits within a couple of days of opening. If you do not have any halloumi you could always get some pre-cooked chicken to go on the side or just add some salad with as fresh tomatoes and lettuce to bulk it out and give it some freshness. If you have a particular cous cous recipe you love to cook, let me know in the comments below! This entry was posted in Food and Drink, Recipes and tagged Cheese, comfort cooking, comfort food, Cook, cooking, cous cous, eat, eating, food, food blog, food blogger, food bloggers, garlic, halloumi, home cook, home cooking, life, Lifestyle, lifestyle blog, lifestyle blogger, lifestyle bloggers, mushroom, onion, pepper, quick cooking, quick recipe, Recipe, simple food, tasty, tomato, vegetables, vegetarian, yummy. Bookmark the permalink.